A delicious and light salad to wow your friends with!! Cut the goats cheese into large chunks. Cut the beetroot into large wedges and put them on a roasting tray with a drizzle of olive oil and some salt and pepper. Transfer them to the oven and roast for 20-25 minutes until they are just tender. Meanwhile and on a separate tray lined with parchment put the chunks of goats cheese in the oven for 5-6 minutes- until just beginning to melt. Prepare the dressing by mixing together the walnut oil and the balsamic vinegar and store until required. Add the orange juice to this dressing also. Arrange the rocket in your serving bowls. Divide the orange segments between the bowls. 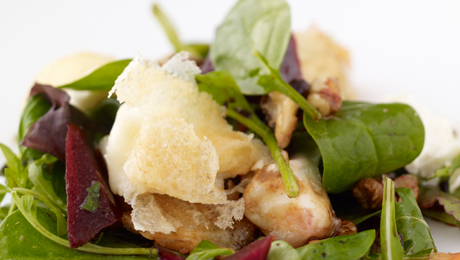 Scatter in the warm beetroot and the baked goat’s cheese. Toss in the walnuts at the end and drizzle generously with the nutty dressing.